Despite the YTD +7% outperformance, we still expect more room to run for SREITs in the benign interest rate environment ahead. We project stronger DPU growth of 1.3% in 2019F and 2.0% in 2020F with office segment offering the strongest expansion. Our strategy now is to go for laggard with value such as SUNTEC REIT and keeping our liking for CDL HOSPITALITY TRUSTS. Maintain Overweight. FSTREI has outperformed the broader stock market, up 7.4% against the 4.5% appreciation in the broader FSSTI index, buoyed by improved market sentiment on a more dovish interest rate hike environment. SREITs are trading at c.4.9% 12M forward dividend yield and at 1.06x P/BV, which is about midway between the average and +1 s.d. bands. Office spot rents continue to rise, upbeat sentiment filtering to business parks segment. Most Office REITs reported positive rental reversion, in tandem with the rising spot market. This has begun to boost average portfolio rents. The improved office leasing market has begun to filter into the prime business parks segment with MAPLETREE COMMERCIAL TRUST (SGX:N2IU) reporting positive high single-digit rental reversion for Mapletree Business City 1 (MBC1). Stronger positive reversion for retail SREITs. Latest results showed that rental reversions were encouraging, with SPH REIT (SGX:SK6U) delivering the strongest rental reversion of 9.7% in Sep-Nov 2018. This was followed by FRASERS CENTREPOINT TRUST (SGX:J69U) (+6.9% in 4Q18) and Vivocity (+4% in Apr-Dec 2018). CAPITALAND MALL TRUST (SGX:C38U)’s Westgate reported its first positive rental reversion in 4QCY18, with a full-year rental reversion of +0.6% vs. -0.5% in 9M18. Most of the other assets under CAPITALAND MALL TRUST reported +1 to +3% rental reversions. Stronger Revpar performance in 2H18. The hospitality REITs reported more encouraging RevPAR performance during 4Q18. Generally, RevPAR growth was stronger on a q-o-q basis, thanks to strong demand in Oct and easing competition in the industry as the new hotels filled up their occupancy. While the REITs’ RevPAR performance was weaker than the industry’s RevPAR performance (11M18 +2.3%, Oct-Nov 2018 +5.2% y-o-y on average), we understand that they outperformed their close competitors in their respective segments. In 4Q18, ASCOTT RESIDENCE TRUST (SGX:A68U) and CDL HOSPITALITY TRUSTS (SGX:J85) declared higher-than-expected capital distributions from the previous divestments, beating our full-year DPU forecasts. Operationally better, new supply tightening. Industrial REITs’ DPU growth was mainly driven by contributions from new acquisitions and AEI completions. Occupancies and rental reversions generally improved q-o-q. New supply in the next three years remains tight, especially in the business park sub-segment. New business park supply of 44k sq m in 2019F and 63k sq m in 2020F are significantly lower than the past three years’ average of 89k sq m; the spaces have also been 100% pre-committed. Overall funding costs remained stable. The latest results showed that SREITs’ overall all-in funding costs have remained stable q-o-q and have not significantly changed from a year ago as higher base rates (owing to rising SIBOR or SOR rates) are offset by narrower spreads. Some income volatility from office relocations. While Office REITs’ committed portfolio occupancy remained high for 2018, above industry average, the relocation of some major tenants resulted in some income volatility while the spaces are back-filled. This was partly offset by tenant compensations. While tenant sales were generally positive for the Retail REITs, except FRASERS CENTREPOINT TRUST (SGX:J69U) and MAPLETREE COMMERCIAL TRUST (SGX:N2IU) due to changes in tenant mix and ongoing AEI, respectively, tenant sales growth lagged behind shopper traffic growth which indicates that consumers are still cautious about spending. Slower China and Indonesian tourist arrivals. Tourist arrivals from China and Indonesia slowed substantially in Nov 2018 while 11M18 industry RevPAR grew slower-than-expected, at 2.3% y-o-y, as it took longer than expected for the high supply over the past few years to be digested. However, we note that the weaker tourist arrivals from China and Indonesia in Nov did not affect the REITs’ performance. In fact, they see consistent demand from tourists in these two countries. We believe the RevPAR should continue to improve in 2019F on the back of lower supply and as the effect of pricing pressure from the new hotels eases. Two-tier recovery, trade concerns delay decisions. Older and lower specification properties are still experiencing occupancy weakness as the flight to quality continues. Though there was an improvement, rental reversions generally remained negative as REITs continue to have lower pricing power as they focus more on filling up vacancies. Tenants have also been delaying tenancy decisions as they wait out the US-China trade war uncertainties. Following the recent round of post results earnings updates, we project SREITs to chalk DPU growth of 1.3% in 2019F and 2.0% in 2020F, up from 0.5% in 2018, with the strongest coming from Office REITs, Retail REITs, Hospitality REITs and Industrial REITs sub-sectors. This, we believe, would be underpinned by organic rental improvements as most sub-sectors (except selected industrial segments) move past supply indigestion, as well as by acquisition growth. SREITs’ balance sheets remain healthy, with gearing ticking down q-o-q to 36.9% in 4Q18 post the latest round of asset revaluations. In addition to a small 10% and 13% of SREIT debts maturing in 2019F and 2020F, c.82% of total SREIT debts are on fixed rate basis. This should largely insulate SREITs’ earnings from interest rate hikes. Anecdotal evidence also showed that average funding costs for SREITs have also remained relatively unchanged on a q-o-q basis in 4Q18 and remained stable from a year ago. We expect SREITs to actively explore inorganic growth opportunities, both in Singapore and overseas, from both third-parties as well as their respective sponsor’s pipeline. MAPLETREE LOGISTICS TRUST (SGX:M44U) has articulated that it is still keen on its sponsors’ assets in China while MAPLETREE COMMERCIAL TRUST and FRASERS CENTREPOINT TRUST could be close to tapping their sponsors’ pipeline in Singapore. SREITs have outperformed YTD, led by the large and selective mid cap SREITs, while the smaller cap SREITs have lagged behind. We continue to like SREITs as we expect their share prices to continue outperforming the broader market in the more benign interest rate environment. Given the outperformance of large cap and selective mid-cap SREITs, we switch our preference to the laggards. 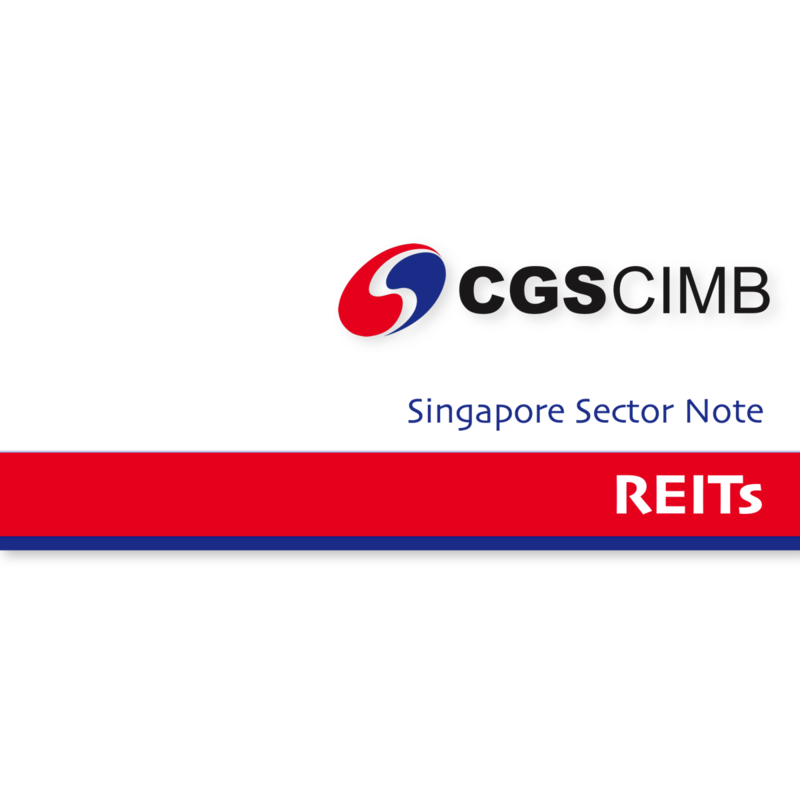 We revise our top SREIT pick to SUNTEC REIT (SGX:T82U) (Add, Target Price S$2.06) and maintain our liking for CDL HOSPITALITY TRUSTS (SGX:J85) (Add, Target Price S$1.80). With 8.2% and 17.6% of its office NLA due to be re-contracted in FY19F and FY20F, respectively, we believe SUNTEC REIT is well placed to leverage on the rising office rental trend. In addition, it plans to explore acquisition opportunities, particularly within its current geographic footprint. Furthermore, management has signaled its medium-term intention to manage down the proportion of capital distribution, which we believe would be viewed positively by investors when that materialises. CDL HOSPITALITY TRUSTS remains our top pick for the subsector given that it is a bellwether for Singapore’s hospitality stocks and we project a stronger DPU growth of 2.5% in 2019F (vs. 0.4% in 2018), driven by the reopening of its repositioned Dhevanafushi Maldives Luxury Resort (DMLR), completion of AEI in Orchard Hotel, a full year’s contribution from the acquisition of Hotel Cerretani Florence, Italy, and a recovery in the hotel industry in Singapore. We maintain our Add rating, with a higher Target Price of S$1.80. We retain our sub-sector rankings of Office REITs, Hospitality REITs, Retail REITs and Industrial REITs, in this order of preference. For investors who want exposure to retail SREITs, we would advocate switching to MAPLETREE COMMERCIAL TRUST ahead of CAPITALAND MALL TRUST, given the former’s potential acquisition catalysts. Within the office segment, we move SUNTEC REIT ahead of CAPITALAND COMMERCIAL TRUST (SGX:C61U), in view of the latter’s share price run-up. For Industrial REITs, we continue to like MAPLETREE LOGISTICS TRUST for its diversified portfolio.